Proper installation of your new home comfort system is critical to its proper functioning and reliability. We want you to have full trust in the superior workmanship provided by AL DONE AC MAINTENANCE CO. LLC. Therefore we now guarantee your 100% satisfaction. 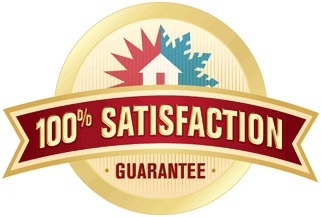 Our 100% Satisfaction Guarantee may just be the most iron-clad Satisfaction Guarantee you’ll ever see, anywhere, in any home service industry. When you trust AL DONE AC MAINTENANCE CO. LLC Air Conditioning with the purchase and installation of your new AC system, you get our unprecedented commitment to your complete satisfaction. The AL DONE AC MAINTENANCE CO. LLC 100% Satisfaction Guaranteed ensures your complete satisfaction with the purchase AND installation of your new cooling equipment. Simply compare our 100% Guaranteed to any other company and you will clearly see the difference of who stands behind their products and installation.